If you are planning to head to Ballsbridge for a quiet pint or a cup of coffee this Friday or Saturday – think again. 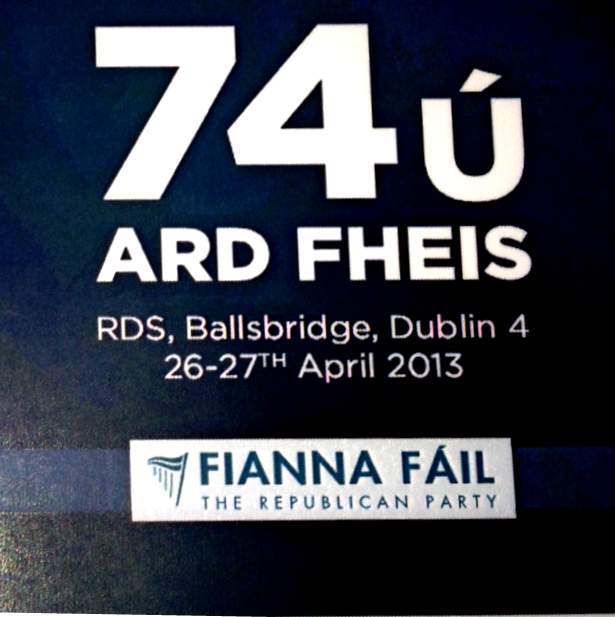 From about 5pm this Friday until well past mid-night on Saturday the area around the RDS will be saturated with about five thousand exuberant and excitable Fianna Fáil-ers gathered for the party’s Árd Fheis – including yours truly. If you decide to follow the Árd Fheis proceedings online or on air you can expect to hear the Good Friday Agreement (GFA), whose fifteenth anniversary passed two weeks ago with little acknowledgement from the Government, mentioned several times. Many in Fianna Fáil fear that its greatest recent political achievement is being slowly air brushed out of official history. The impression is being given that the GFA was merely the logical and inevitable consequence of the 1985 Anglo Irish Agreement, about which we have heard a lot following the deaths of both Garret Fitzgerald and Margaret Thatcher. As one of many people who spent countless hours travelling up and down to Belfast on pre M1 roads that stopped for lollipop ladies in Balbriggan and Julianstown, I can assure you there was nothing inevitable about it. But the Good Friday Agreement is also something of a metaphor for Fianna Fáil itself. We now see that that getting agreement was the easier piece of work when compared with the effort and energy required to get it implemented and working – well, almost working. The same is true of Fianna Fáil. The work required to get the party to this point has been huge, but it as nothing to the work ahead. While last year’s Árd Fheis focused mainly on important internal reforms, such as One Member One Vote, the truly difficult work starts now. This Árd Fheis is more about facing outwards and talking to an electorate who now shows signs of being ready to listen to what the party has to say. But the party’s improving opinion poll figures should not delude pundits, or even party members, to thinking its resurgence is assured. To be brutally frank, what has Fianna Fail said or done in recent months to justify such increases? While it has produced some very fine policy proposals such as the Family Home Bill and Regulation of Debt Management Advisors Bill, they hardly account for bounce. Nor does the performance of the party’s spokespeople. Without doubt the party has scored significant hits on the government in recent months, particularly via its Health Spokesman Billy Kelliher, its Finance Spokesman Michael McGrath and its Justice Spokesman Niall Collins and, of course, the party leader Michéal Martin, but it is finding it difficult to mark all bases with such few Oireachtas personnel. While he has several new people inside the Oireachtas who he can use effectively: such as Senators Averil Power and Marc McSharry, perhaps the leader also needs to look outside the ranks of the parliamentary party for other new faces and voices to put on Radio and TV in senior roles – Dublin Bay South’s Cllr Jim O’Callaghan for instance. The hard truth is that the increases are as much down to Fine Gael and Labour’s travails as they are to any softening of attitude to Fianna Fáil. Besides, as the poll analysts would tell you, it is dangerous to read too much into opinion polls where over 30% of the respondents are answering: don’t know. This is not to underestimate the size of what the party has achieved. At this time last year it was a tough job convincing others that while the party may be down, it was not finished. The big achievement has not been the increases in the polls, but rather the halt in the party’s decline. At last year’s Árd Fheis the party helped reverse that decline by re-introducing itself to its own members, this weekend it starts the even great task of re-introducing itself to its former supporters. Let’s hope it has more success in doing that than the GFA has had in getting its institutions working. Previous postWhy waste time speculating about possible @FiannaFailparty and @FineGaeltoday link-ups? Next post@FiannaFailparty Back from the Brink?